Individuals, families, and businesses can all benefit from the A+ WeCare Medical Discount Program that offers savings on A+ Urgent Care visits, services and procedures all year long. WeCare was designed for customers who are between health coverage, may not have health insurance, or whose high deductibles are prohibitive toward getting the care they need. What is the WeCare Program? 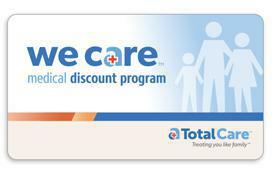 Our WeCare Discount Program is an affordable, prepaid annual membership with two types of tiered plans to fit the specific level of care you need. Though WeCare is not an insurance plan, it can provide you with a number of convenient, cost-saving features that can help save on continued medical visits to A+ Urgent Care. There are no hidden contracts or costs and it’s fast and easy to join. Please call 775-777-7587 for corporate membership pricing. Sign up for your WeCare Membership today! Interested in saving up to 25%* on your visits to A+ Urgent Care? Call or stop by our clinic to join and save! *The WeCare Medical Discount Program is not an insurance plan and is available only for patients who do not have insurance, have a high deductible, or have gaps in insurance coverage. Neither you nor A+ Total Care can file a claim with any existing insurance carrier for any visit in which you use your WeCare membership. Benefits do not apply anywhere other than A+ Total Care in Elko, Nevada. Prices are subject to change at time of renewal. If the WeCare Program is discontinued, there is no guarantee of similar programs offered for any subsequent year.